Day 1: - Sanur to Ubud via Tegenugan waterfall. 38 km. We will pick you up from your accommodation at 05:30; you are then taken to our shop where you will meet the other cyclists & guides as well as our driver and other support crews for the tour. Then place your additional clothing and items in the support vehicle. 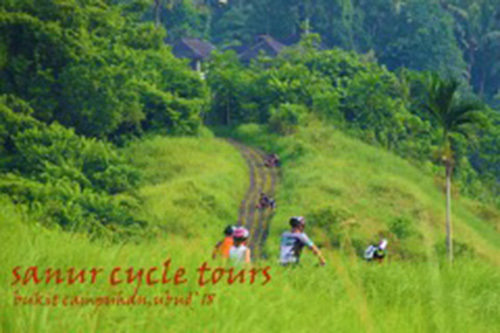 You will then personalise your bicycle & try to depart for Ubud at around 06:00. The back up vehicle will drive with you until you reach the rice fields in case any assistance is required. 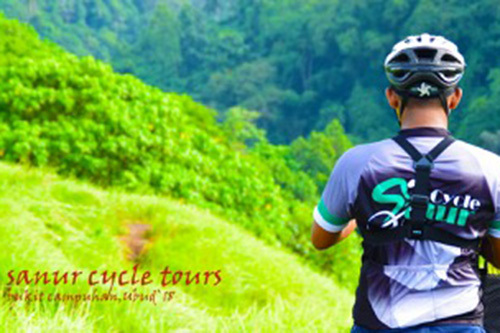 From here you are cycling together with our guides until you reach Tegenugan Waterfall. Our back up vehicle will again meet you here or wait at Kemenuh Butterfly Park for you to return from the waterfall if you require anything from your items i.e. towel for swimming etc. After spending an hour or so here at the Butterfly park and having some breakfast, we then continue to cycle to Ubud via the rice fields. Arriving in Ubud at around 12 to 1 pm. You will then cycle to "Juice ja Café" for lunch. Whilst you are enjoying this we will take your belongings to your accommodation and have you checked in. After lunch you will then cycle to your accommodation for a well-earned rest and to relax & unwind. The afternoon is then yours to do some exploring of Ubud or enjoy a massage from our professional Masseuse who will accompany you for the 4 days. At around 18:00 we will go for dinner to a local warung or restaurant. After dinner you return to your accommodation for a well-deserved sleep. Total distance is 38 km. 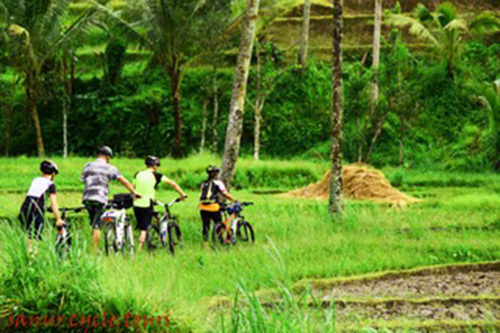 We try to begin early again after having breakfast at your guesthouse & cycle from your accommodation to Tegelanlang rice fields. which is a small version of Jatiluwih Rice terraces, you will see how the Subak irrigation system works to feed the rice terraces. 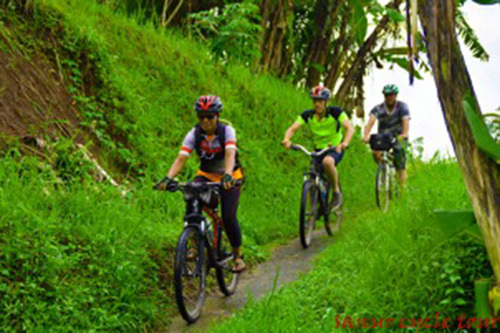 We then cycle across to Campuan ridge, which is one of the most scenic sites around Ubud and is a very common trek for walkers from Ubud. We take our time to cycle here arriving and stop here where you can enjoy cycling along the ridge. 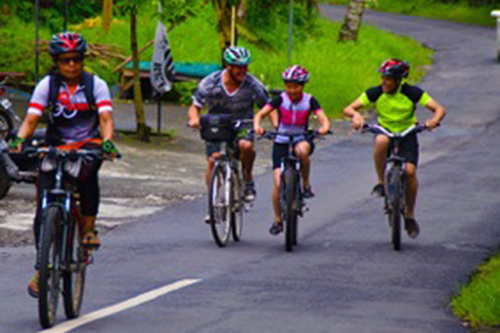 We then begin our way back toward Ubud enjoying some of the smaller quieter roads & trails on our way. You will then have your lunch in a local warung before returning to Ubud. You will then stay at your accommodation again for our 2nd night. Total distance is 35 km. Day 3: - Jatiluwih to Ubud. 50 km. 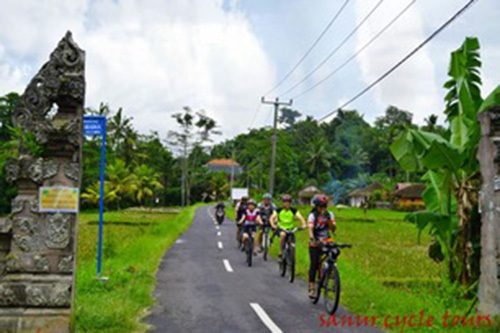 On the evening of the 2nd night SCT will arrange to have the bicycles transported to Jatiluwih and stored there for our cycle back to Ubud. We will depart Ubud early morning at 5 am in our back up vehicle and drive to Jatiluwih. We will take breakfast at “Dasa Vayu” healing retreat before beginning our ride back to Ubud via Marga Monument & Taman Ayuk. We should arrive back in Ubud around lunchtime where you will have your lunch at "Warung Krumpu" in the rice fields. 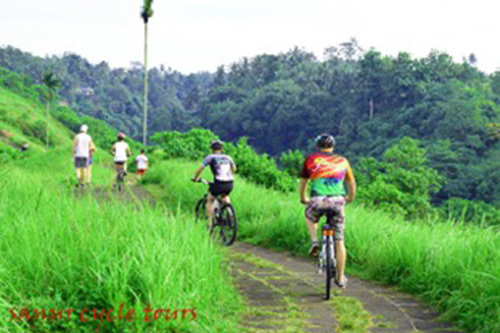 From here it is a short ride into Ubud where you will return to your accommodation. Total distance of around 50 km. After we take breakfast at our hotel then we begin the last 26 km back to Sanur through the rice fields arriving back in Sanur around mid morning. You can stay with us for lunch or we can take you to your hotel or guesthouse. 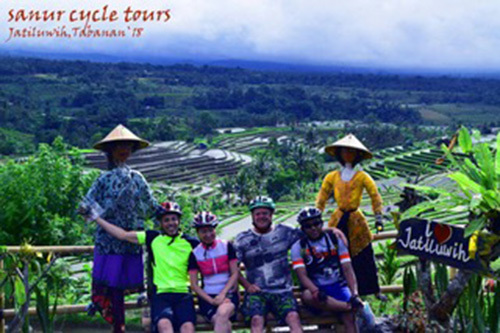 Your tour with “Sanur Cycle Tours” is then complete. Total distance is 26 km. Thank you for your experience with us!